My consultation with a patient lasts for 60-90 minutes, in the course of which we do endoscope examination (fiberendoscopy) of the nasal interior to enable my patients to breathe even better after the cosmetic and functional procedure. The very first postulate of cosmetic surgery in my opinion is the function and not just aesthetics. All the procedures are done with a CLOSED technique (from the inside), leaving no visible stitches (they are self-absorbed) as well as no visible scars. We operate on your nose JUST ONCE, there is no re-operating. REMEMBER – it is vital that the nose is correctly operated the first time procedure is performed. I was given a nick-name “THE KING OF NOSES” due to a special way of RESHAPING noses, which requires an extraordinary feeling for cartilage and soft tissues. You have to be constantly aware that nose is a functional and immunological organ with over 10 functions. First, beware those who say it is a simple operation (“It’s just a small hump and can be easily fixed!”). The hump must be completely removed and shown to the patient; it must not be chiseled for that will create more smaller humps instead of a large one. It is of utmost importance for the operation to be performed from the INSIDE, with an inner incision i.e. a CLOSED TECHNIQUE. If the open technique is used, the swelling of the nose can last for one to three years. Make sure you ask your surgeon about his qualifications and training, for many years of experience acquired in only one hospital mean nothing if dated surgical techniques were used. Ask your surgeon to eliminate potential breathing problems while performing the cosmetic operation, since 90% of cosmetic operations require correction of the deviated septum. Do see at least three surgeons before agreeing to have a nose operation done. Ask the surgeons all you’d like to know, because there are no “silly” questions. Do not rely on the computer animated image, for the computer will not be operating on you! A nasal cosmetic surgeon should reshape the nose with minimal surgical trauma, i.e. use an internal approach to obtain a natural shape of the nose, in perfect harmony with facial features, thus giving a face a natural and youthful look. We must stress that there is no nasal correction i.e. cosmetic operation without simultaneous performance of a FUNCTIONAL OPERATION. It means that the first postulate of cosmetic operations is function and not aesthetics. A nose is a pyramid inside of which a deviated septum must be straightened i.e. corrected in order to enable the patient to breathe properly. More than 15% of the population does not breathe properly through the nose, but use the mouth to assist the breathing (snoring, dry mouth, fatigue). Only after the problem of sinuses has been solved, i.e. a breathing disorder, cosmetic operation of the nose can be performed. Our clinic is one of the few in the world that can perform simultaneous cosmetic and functional nose surgery. When choosing a cosmetic surgeon, make sure you check whether he/she is certified for performing nasal surgery i.e. are they a certified Ear, Nose, and Throat Surgeon (an otolaryngologist/rhino surgeon) as well as which clinic they were educated and trained at. It is of utmost importance to perform both operations (cosmetic and functional) in one procedure, since you may have even worse breathing problems than prior to the operation What gives our patients additional confidence is the fact that Dr.Glusac is both a certified member of the European Academy of Facial Plastic Surgery as well as a certified Rhino (Otolaryngology) Surgeon. Cosmetic and functional nasal surgery is done on patients above 16 under local anesthesia. After the operation, patient’s breathing is assisted by special tubes, which recently was not feasible even in large clinical centers. Following the procedure, a patient wears a special plastic cast for only 4 days. The procedure does not cause swelling and/or bruising, due to minimally invasive surgical approach in reshaping the nose. c) closing septal perforations with a special method, which is the most demanding operation in nasal surgery. 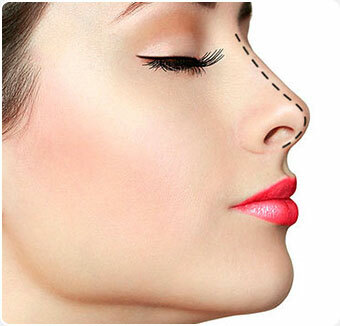 Who are suitable candidates for plastic surgery of the nose? These are the people looking to improve their facial appearance. If you're physically healthy, psychologically stable, and realistic in your expectations you may be a good candidate. Rhinoplasty is also indicated for correction of deformities following a trauma (nasal fracture) or a disease, for correction of asymmetry and for an improvement of the nasal airway.